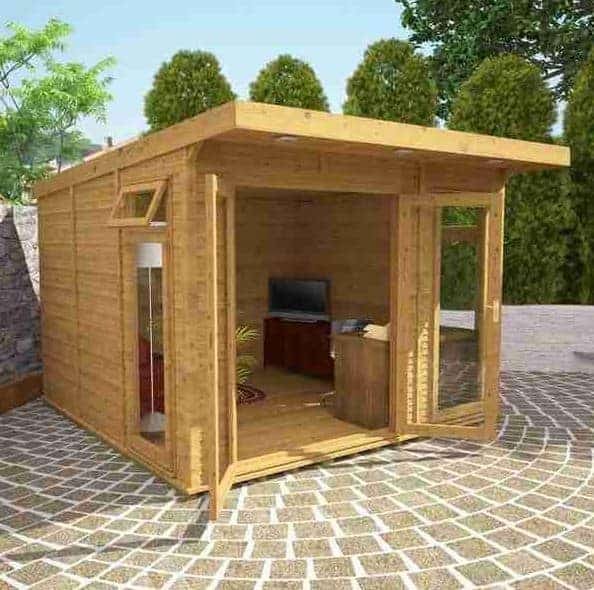 A log cabin style garden room can add a real touch of style and elegance to any property, and this is exemplified here. Waltons have a reputation for creating strong and secure log cabins that are redolent of luxury, and that’s certainly what we found on this occasion. Spacious and with natural light flooding in thanks to its double glazed panels, it’s a pleasure to spend time inside so is ideal for those who like to enjoy looking out at their garden. The double glazing, present on windows and on the door, helps to keep rain and wind out and heat in, and it was also good to see that the building as a whole was insulated thus creating a warm and welcoming atmosphere. 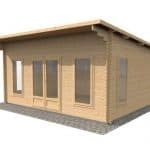 Weather protection is also provided by the pitched roof which forces rain away from the interior, and from the tough and tightly locking tongue and groove cladding. 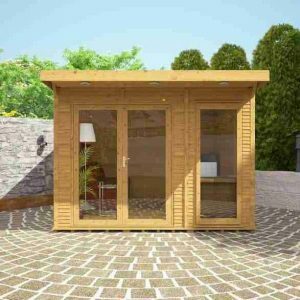 It’s reassuring that a professional installation service is provided free with this garden room, as we know that some people are put off by the time and effort that would otherwise be needed to install a large garden building such as this. 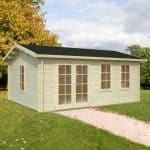 Featuring a modular design it’s also easy to add extra doors or windows, and to take advantage of the many customisation options that are available. 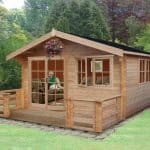 This large log cabin style garden room allows the owner to create the most comfortable and luxurious room in their home in the pleasant surroundings of their garden. We really liked the look of it from the moment we saw it, thanks to its elegant combination of glass and smooth timber cladding, and the best thing of all is that whilst it is tall and roomy it is less than 2.5m in height, which means you don’t need planning permission to have it on your property. With a free installation service included as well, it means that you’ll be able to have your luxury summer house in situ quicker than you imagined. 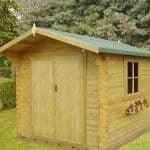 The roof is made of tongue and groove cladding, which is feature that we always like to see as opposed to cheaper solid sheet materials, and the mineral felt on top of it is reassuringly tough. It also has a slight pitch, helping water run away. The ridge height is 2.36m and the eaves height is 2.18m. When choosing where to position the building, keep in mind that the internal width is 3.00m and the internal depth is 3.06m. It was good to see that tongue and groove cladding had been used across all this building’s surfaces, not only on the walls. The 16mm shiplap+ cladding used on the exterior panels is significantly thicker and tougher than most that we see, and provides excellent protection against rain and wind. 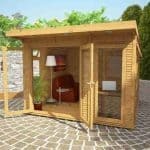 It’s also kept warm inside all year round, thanks to the use of Airtec and EcoQuilt insulation. It was also pleasing to see a solid 44 X 58mm frame being used, giving excellent stability. The floor, like the roof, is made of 12mm thick tongue and groove cladding. We were pleased to see that it’s supported by 44 X 28mm floor bearers, as this elevation protects the base against the potential danger of rising moisture. It was good to see that this building is protected by a 10 year anti rot guarantee, which is what we’d expect at this price. It was disappointing, however, to find that not only was the log cabin unpainted it was untreated as well. The terms of the guarantee state that it must be treated with a good quality white spirit based wood preserver in order that the warranty remains valid, but the lack of any prior treatment also means that it should be treated straight away after installation. It’s important to note that whilst essential, this isn’t carried out by the installation team. The fully glazed double door dominates the front of this garden room, and its generously sized so you won’t have to bend down when walking in or out. This is demonstrated by the door height of 6’2 and a door width of 4’11, both of which are more accommodating than many openings we see on similarly sized buildings. As well as the glazed doors, there are two further full height window panels. We were pleased to see that the Argon filled glass units had a thickness of 14mm, which is very tough and impact resistant. Two of the panels also incorporate top opening windows, allowing easy and natural ventilation. It’s not just the shatter proof nature of the glazing that gives this log cabin strong security credentials, as we were glad to see that a mortice lock had been included as standard. This means that this door should be just as secure and reliable as your house doors, and the sight of it alone may be enough to deter attempted break ins. We always welcome garden buildings that are customisable, as it allows the customer to modify them to suit their own particular garden. 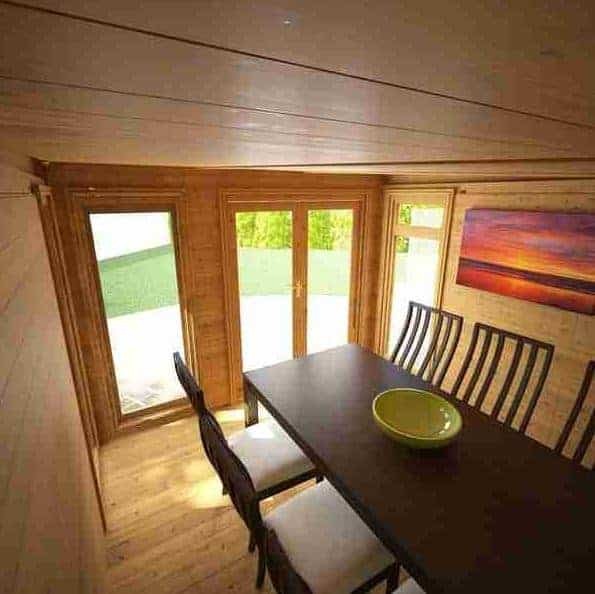 The modular nature of this garden room means that the positioning of the doors and windows can be altered, and because the installation is carried out by others there’s literally no effort involved in doing this. 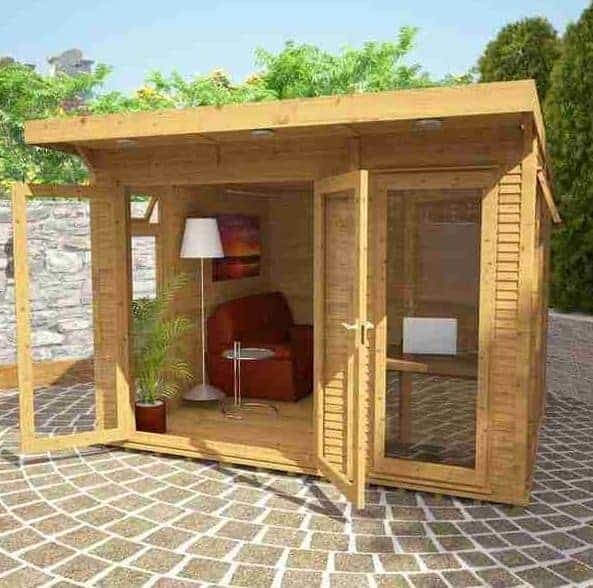 There are also options to add another double door, or to add windows that are either small or full sized and that are either fixed or opening. Every good garden room or summer house needs a power supply, and so it was good to see two different power options available. 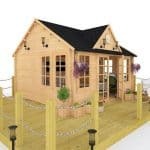 The garden building electrical pack costs £384.95, while a roof-mounted flexible solar panel kit is available for £3,217.95. This is obviously much more expensive, but it will be a hit with greener consumers. 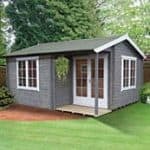 It was apparent from the start that this garden building is made to the highest standard, as demonstrated by the use of high quality cladding and glazing. The cladding itself will prove to be very effective at keeping rainwater out, as will the slightly pitched roof, but this could be compromised by the lack of any preservative treatment applied by Waltons unless the owner adheres strictly to the treatment schedule. There’s lots of room to move around in or to install furniture in, and it was good to see that whilst the headroom is more than adequate it is still below the level at which planning permission would be required. Installation couldn’t be easier or more convenient, thanks to the free service provided. It loses half a mark, however, because of the need for the customer themselves to add a preservative treatment once the installation process has been completed. Whilst this represents a substantial purchase, it is beautifully made and with the right treatment should be very long lasting. Final Thoughts: We found a lot to like in this garden room, even though we would have liked to see it pressure treated before delivery, and it’s very attractive appearance is sure to attract compliments. You won’t need to worry too much about security though, as the integrated lock and tough glazing should keep opportune thieves out, although you may want to add an alarm for extra protection. 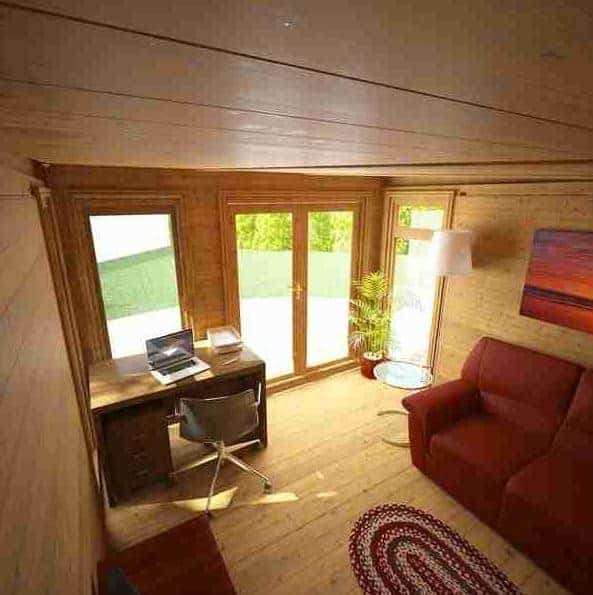 There’s a lot of room inside, so that you could easily install chair, sofa and table, and a wide screen television. Double glazing and insulation create a pleasant interior, and the integrated spotlights mean that you can use it to entertain guests in the evenings.